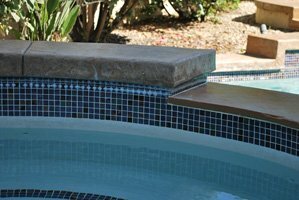 A Bonita homeowner wanted the calcium scale deposits on their swimming tile removed. The south San Diego home has a swimming pool with a raised spa and bond beam. 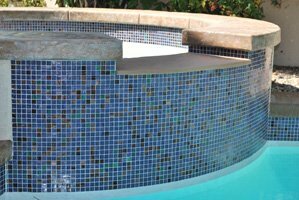 Calcium build up could be seen on the blue mosaic glass tile around the entire pool waterline. Heavy areas of calcium deposits were also found on the spa spillover and on the tile waterline within the spa. 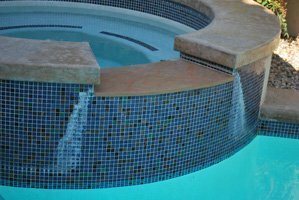 Along with a raised bond beam on one end of the pool is a raised fountain which spills into the pool. On the fountain spillover is the same glass tile which has calcium that needs to be cleaned. 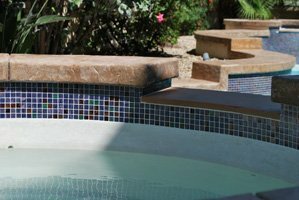 The entire pool tile consists of fairly fragile one inch glass tile with many grout lines. 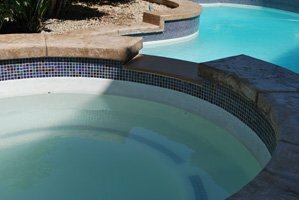 Therefore extra care needed to be taken during the pool tile cleaning process. We first lowered the pool water level to fully expose the pool tile. Although the water level is normally only lowered a few inches below the tile in this case we removed more pool water. The extra water was drained because the conditioner levels in the water was high. Diluting the swimming pool water with fresh water lowered the conditioner levels. After we cleaned the tile along the pool waterline, the tile inside the spa was cleaned. Then the calcium on the spa spillover was removed. To complete the pool tile cleaning we removed the scale on the spillover of the fountain. Once all of the calcium was removed from the glass tile the pool was vacuumed and fresh water was added to the pool.